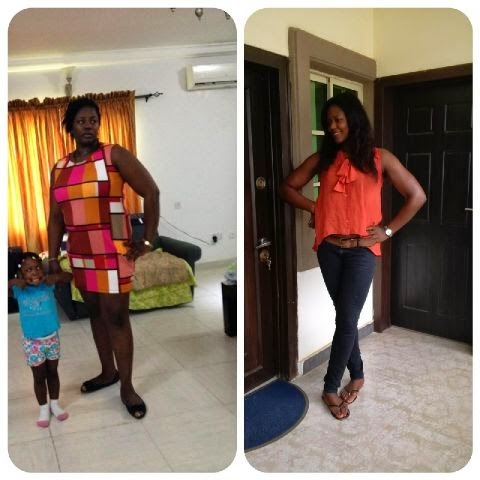 Who is Bolaji and why did you decide to lose weight? What do you weigh now and what dress size are you currently? I used to wear a 18/20 down 22up (UK), 16/18W (US) Currently i wear a US 8 and some size 6. That's about 6 dress sizes down. omg! I changed my diet, started eating good wholesome and healthy meals. Cut of junk and sweets. I made my own meals and if I had to buy food outside it was TFC topper salad and grilled chicken or fish. I worked out like never before and remained focused. I still do, I made a total life-style change. The way i look now. A lot of people are looking up to me now, so i gat no choice. Knowing her from a while back, (we lost contact) when she sent me her current pics i was amazed, i nearly fainted! 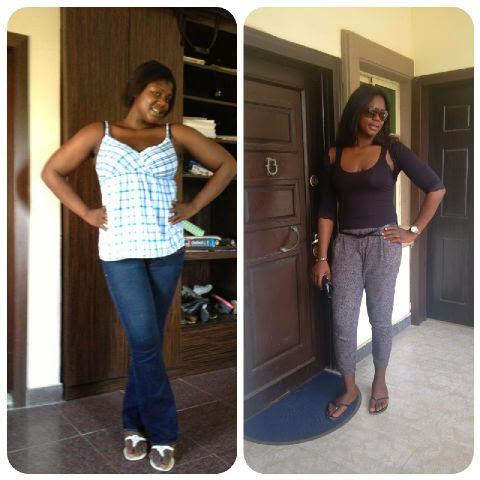 omo, the babe don change!! She looks like a 16 yr old! I am so happy for her and impressed, in fact i am highly impressed, her transformation is one of the biggest i have seen so far. And i know she worked her 'bum bum' off for it. Congrats Bola and please keep it up. Thank you so much for your story and God bless you and all your endeavors. Amen. She look like she subtracted 20yrs from her age. Wow! Amplified fitness and health club. I sure know her story is hot enough to give some of us heat to get up and move, no more excuses! See, she even turned it into a business and shes doing well. There is nothing stopping us from making a change, except us as individuals. Only you, you and you can make the change YOU need. Start the fire today and let it start burning, start burning away the fat you need for change to occur. Take care sweets and God bless. She's def a hero. Thanks Shade. Woah I am impressed and inspired. I am currently like she was when she started this gives me motivation that I can do it and not worry about how long it takes. U can do this dear. Make the decision today and fire up! Exactly, u don't have to worry about how long it takes but av a picture of the end result in mind. Make it ur lifestyle hun. Woah! I am inspired. I went on the low carbs diet for one week. No rice, no yam, cornflakes etc. Today is the eight day n I feel so good. My tummy is flatter, I think I lost 2kg sef with small exercise and atleast 3 litres of water daily. 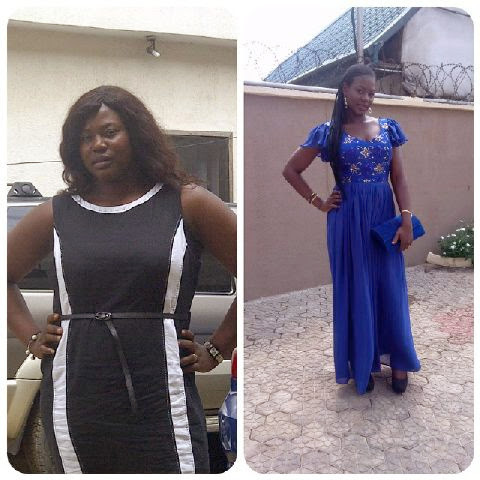 You have inspired me 2 loose weight, may God bless you and grant you ur heart desires. Congrats dear! Am so happy u did ur best, keep going and u will get more results. I really appreciate u and God bless you. Amen to that prayer!! Ride on babes I saw it in ur eyes n I knew u were going somewhere Bola I'm really motivated Luv kip it up. Waoooooow! !thumbs up Bola.i just cant wait to wear a size 8. Size 8 is around the corner for u, just be determined and consistent. U will get there. Amen to that dear. Thanks. Hey, small world it is. I wanted to shed the weight for good a long time now. But at the end it paid off with serious determination and consistency. U can be a 12 by sept u know, just eat clean and exercise dear and pls don't forget ur 3 litres of water daily. Way to go Bola, well done. Thank you Cheliz and Bola for sharing. Wowwwwwzeers! Well done Bola, way to go... Thanks 4 sharing Cheliz and Bola. Way to go. Well done Bola. Thanks for sharing Cheliz and Bola. 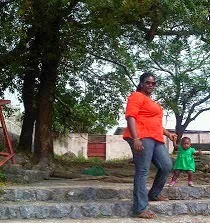 God bless u plenty. Now there is no stopping us. 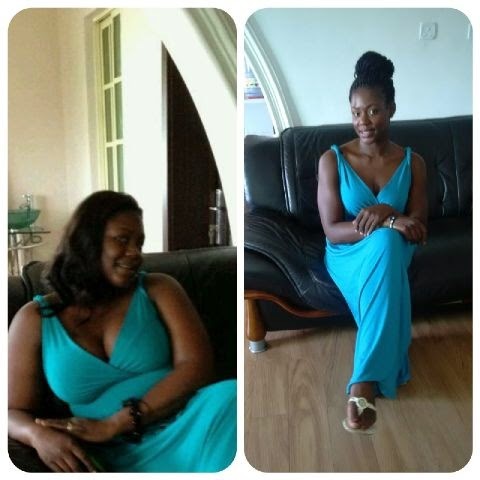 Awww, Tunde, I'm glad u ve lost 14 kg already, wow, dats some good job. Pls don't relent, keep at it and before u know it, u will be at your desired target. Fajez Ekun ( smiles) thanks dear. My goodness! This is shocking mehn and in a damn good way (pardon my french)! If you hadn't said you knew her personally and if Anon up here hadn't also testified to knowing her personally, I would have said this is a proper faboo story cos the before and after pics look so different! Not at all like the same person! Way to go ma'am. I am truly motivated. Started the no-carb diet yesterday (monday) looking forward to seeing results. It's only day 2 but I feel so much lighter though I need to up my water drinking. Apart from other liquids like the tea, coffee, and lemon water, I am currently doing less than 3litres. Yesterday, I only drank about 2 litres of water. Hi Mo'dele lol @ faboo. Glad to hear ur seeing results. Pls keep it up. Take care and thanks. @Mo'dele, i hate drinking water but I found out after exercises in d morning, i consume 50 cl of water and it's so refreshing. Cheliz also told me to try and take at least 2 cups of water after each meal and snack. I was shocked I did 3.5 litres yesterday. I feel really good already. Have a fab day ladies. @Mo'dele I hate drinking water as well cos I am a sweet tooth, I also used to struggle to finish 2ltrs daily. I spoke to Cheliz about this and she told me to try and take at least 2 cups of water after each meal and snack (This really worked for me). If you exercise in the mornings, you would be thirsty and can consume about 50ml of water or more immediately after exercising (really refreshing). 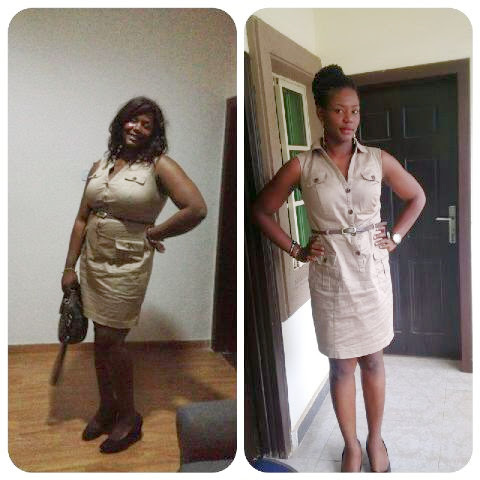 Hi Folakemi, you can start with the detox meal plan for a week and follow up with the fat loss meal plan. Make sure to add some kind of exercise to it. Take care. Dats my squats partner, I walked into BJs gym last year September and till date I'm stil dere! 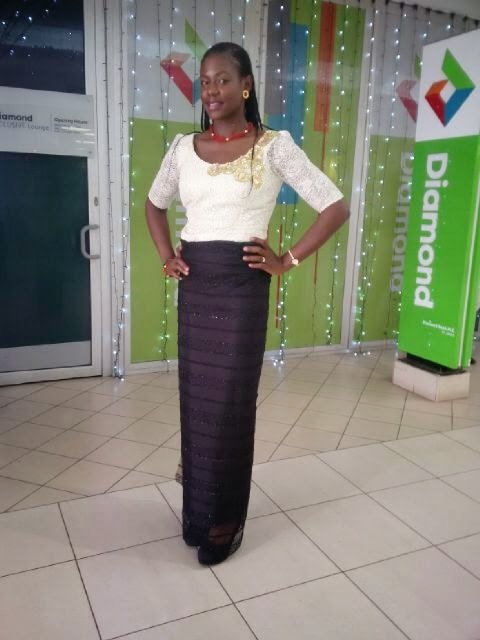 She's a motivator n has d drive of a lion , I workout wt her n dis is no fabrication of story, wen I saw her old pictures I shouted Cus I met d skinny version, her story has tot us al dat we can do ANYTIN once we put our minds to it, av lost 18kg so far and toned up real gud. Sweetie, I love your motivation and drive. Pls dont let anything stop u. Keep exercising and eating right. God bless. Hi sandy. I don't own or know any bbm weight loss group. U can get all thw inspiration you need here. Thanks. Thanks dear. Lol seeing is believing. I remember when people used to tell me that I did surgery, thats its not possible to lose that amount of weight. I just laugh! You can do it too, be hungry for it and you will reach it. hi cheliz, i wish i can do it.